I have been saving my cat Winky's hair for about 1-1/2 years now. I know; it's an odd thing to collect. She's a rescue kitty that I got 2 years ago this past Valentine's day from a shelter in Los Angeles. She's very special - and was rescued from a high kill shelter - saved because she had already been through so much. 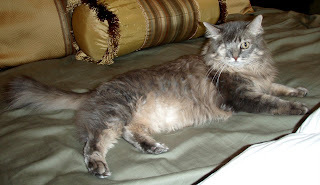 We don't know really how she lost her eye, but the story I was told is this.... apparently she ended up on someones doorstep, with her eye torn out of her face, bloody and beat up from a fight - clinging to life. I don't know the details, but I do know this caring person took her to the vet, where they apparently sewed her eye closed and saved her. Somehow, she ended up at the pound where she was rescued by a group who kept her at their facility for over 6 months until I found her and took her home. By this time, she was very depressed and not really social, however, she's doing GREAT now. I don't know for sure if the details of the story are correct (or true!) 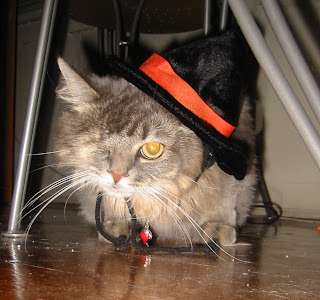 but I do know she's missing her eye and it doesn't bother her at all. She's a very sweet cat, loves to get pet and scratched under her neck and behind her ears - and she keeps me company while I knit at night. She's not a lap kitty; but she does love to lay by my leg and *almost* touch me while she rests. I know it doesn't look like much, but the bowl that the fiber is in measures about 15" across - it's also very deep! I mailed this off to VIP fibers this morning and can't wait to get it spun up. I asked them to make a dk weight yarn for me, similar to Sirdar's Snuggly. I am thinking it'll end up as striping or accents in a sweater - but who knows... I need to see what it looks like to get final inspiration. You didn't give a link to the mill. I will have to search for it. Yes, I've spun cat hair, and it does make a lovely yarn. The only problem is that it is very short, usually, and that is harder to spin. I would blend it with a little merino to help hold it together, and to stretch the amount of cat hair a little further. I have some brushed hair from my sister's cat (no longer around) who loved to be brushed every day. She saved it for me and sent it one day in a soft, squishy package! 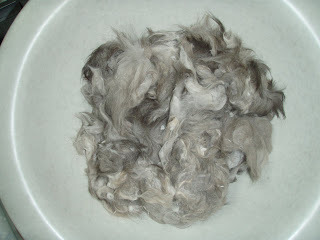 She also had him sheared, but the cut ends are harder to deal with, and make for a scratchy yarn. Not impossible, but not as nice as brushed hair. Of course, many dogs were used for their fur, which is incredibly warm. Most people shy away from cat hair, but there is nothing wrong with it. It's very much the same as angora rabbit fur, and we don't mind that! People are so funny sometimes!! Let us know when you get the yarn. Should be fun to see what you do with it.